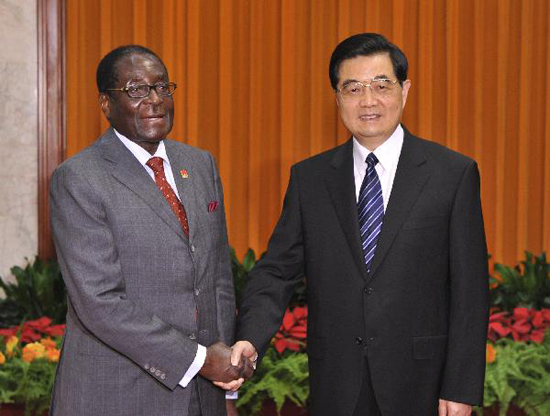 Chinese President Hu Jintao met his Zimbabwean counterpart, Robert Mugabe, in Beijing Friday. They pledged to bolster political, economic and cultural cooperation between the two nations. During their one-hour talk at the Great Hall of the People, Hu and Mugabe hailed the development of bilateral relations since the two states established diplomatic ties in 1980. President Hu urged the two sides to boost high-level exchange while also promoting cooperation between government departments, legislative bodies and ruling parties. He also said the two countries should keep in close communication on issues that concern each other's core interests. "China supports the Zimbabwean government's efforts to promote economic recovery and development and will further cooperation in the mineral industry, agriculture and infrastructure construction," Hu said. China will also expand cultural exchanges with Zimbabwe, especially in areas like the arts, education and human resources training, Hu said. Mugabe attended the Zimbabwe national theme day at the World Expo in Shanghai Wednesday. He said he expects the two states to boost cooperation in trade, education, healthcare and infrastructure construction. Mugabe said his country welcomes Chinese investors and he thanked China for its long-term support of Zimbabwe.